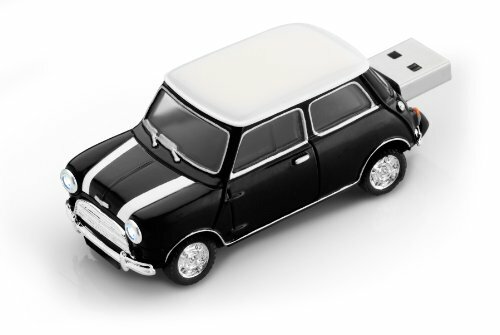 Officially licensed Mini Cooper Mk1 Car USB Flash Drive in Black body with white roof and bonnet stripes. It is for use with a desktop computer or laptop with Windows 7, 98, 98SE, ME, 2000, XP or Vista on a Mac with OS / X 10 or higher. The drive is a 1:48 scale metal die-cast model car precisely to the smallest detail with transparent windows, wheels and bright lights. The USB connector is cleverly hidden in the trunk of the car – based on a handle, it automatically opens the trunk and pull out the USB port. The USB drive has 4 gigabytes of data and characteristics, the headlights light up when the memory stick is connected to the computer. It plugs directly into any USB port on your computer that the new drive is recognized immediately for use without the need for device drivers.